Bring on the polka dot notebooks and freshly-sharpened pencils. Antigone Books is a gold mine of bright notebooks and colorful pencils. Prices Subject to change. A sample of the office supplies sold at Bon Boutique. Prices subject to change. A collection of our favorite finds from the northeast-side gift shop Inside + Out. Prices subject to change. You can get just about any variation of office supplies with the UA logo at the campus bookstore. Prices subject to change. As a kid, one of the best parts of back-to-school was wandering the aisles of an office supply store, plotting out a folder color scheme for the coming year. At least for those of us who love the smell of a fresh notebook in the morning. With summer winding down (and Vail School District already back in class), we're daydreaming about the days when we had an excuse to stock up on Lisa Frank notebooks and glittery mechanical pencils. Did anyone else tote a JanSport backpack their entire high school career? If you're school shopping for your kids (or just need a little pick-me-up for your grown-up life), perhaps it's time for a new journal. Or three. We checked around to see who has the best prices, cutest backpacks and lunch boxes. We picked four local shops where you can find an assortment of notebooks, pencils and sticky notes — and lots of other goodies. None of the stores featured here exclusively sell office supplies, but we found a handful of items that will brighten up your desk and your day. To add a bit of sophistication to your workday, stop by Bon Boutique, 760 S. Stone Ave. With vines creeping around the exterior of the building, the shop is tranquil and well-stocked with a variety of beautiful clothing, toys, books and knick knacks. We obviously hung out around the table stacked with notebooks, rulers and polar bear sticky notes — much of it from Japan, interestingly enough. (Listed to correspond with the photo above, from left to right, starting with the dog pencil pouch). If you are a Wildcats lover, the main bookstore inside the student union on the UA campus, 1209 E. University Blvd., has you covered. There is literally a Wildcat or the Arizona logo plastered to every folder, pen or notebook you could want. Downstairs, you'll find all of your basic school supplies (not all of it has a UA logo), including a wall of Sharpies and colored pens. Upstairs, you'll find some fancier office supplies, like a Moleskine notebook with a silver Wildcat etched on the cover. (Listed to correspond with the photo above, from left to right, starting with the backpack). This newish gift shop on the northeast side, 5425 N. Kolb Road, has tons of cute, cactus-themed goodies, plus an air plant bar where you can pick pots, plants and fillers. The shop also has a good selection of snappy sticky notes and inspirational notebooks. (Listed to correspond with the photo above, from left to right, starting with the sunglasses notepad and pen). There are so many treasures to find stashed among the shelves at Antigone Books, 411 N. Fourth Ave. You'll find journals and planners galore here, plus a fun assortment of colored pencils and calligraphy pens. (Listed to correspond with the photo above, from left to right, starting with the 2019 sloth planner). Your cactus-loving heart will be happy here. 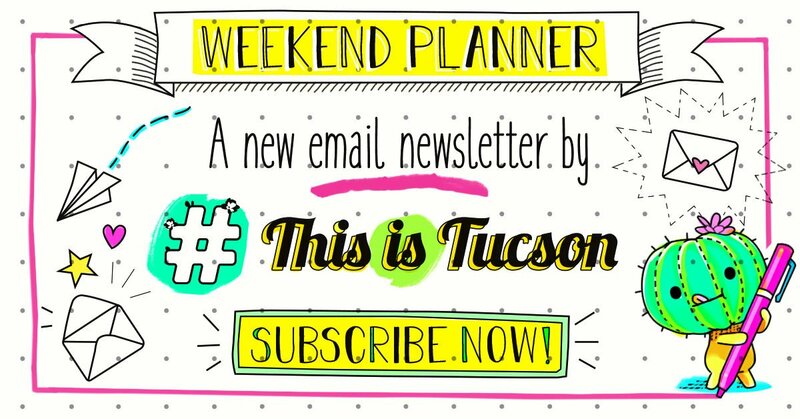 Pick from 36 Tucson-inspired titles. The Harry Potter series has been in the U.S. for 20 years. If you love your hometown, share the love with your home.